Autocal generates these numbers for you, there is no manual entry of hundreds of numbers. All you need to understand is horsepower and rpm plus a few other variables. 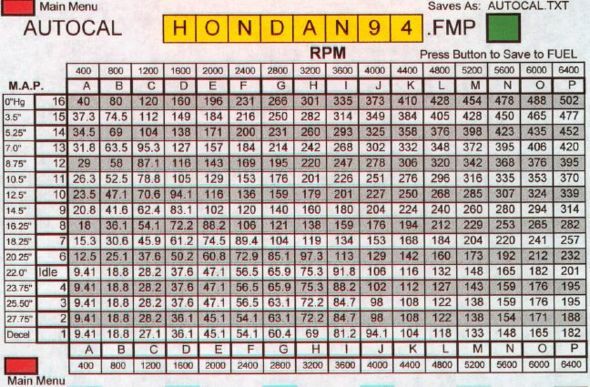 If you want to add ten horsepower you do just that and Autocal recalculates all these numbers for you. You have the ability to shift the fuel delivery to account for changes in camshafts, exhaust systems etc.in a few minutes with no tedious entry of a sea of confusing numbers. As you can see there are no milliseconds in the fuel map, only numbers representing actual fuel delivered to your motor. Literally millions of calculations can be accomplished in a few seconds on a fast PC. Autocal requires a very fast Pentium or Mac because it it number intensive. Let the computer do the entries for you while you concentrate on the tuning. You observe, make a decision and Autocal does the work for you. No more brass jets, no more spilling float bowls, no more pseudo experts who don't know squat.